For 47 Years, I have been a Football Talent Super Scout and I have always been looking for The Unbelievable “Under The Recruiting Radar Football Talent” For The NFL or For College Football Coaches. When you are a Football Talent Scout, you rarely go to an Office, for work, every day, like most other Business Men, but most of the time, I would be going To Another Football Stadium To Try and find Another Super-Star That is Currently “Under The Recruiting Radar” and then Evaluate Him and Rate and Rank Him. So on most every Thursday and Friday Night, I would Find The Best High School Football Game, Irregardless of Distance from my Home, and then I would be on The Sideline at The Start of The Game and Searching for That “Under The Radar Super-Star” in that Game. In Searching for That “Under The Radar Super-Star” I might Walk-Around that Football Stadium Five or Six Times on a Thursday and Friday Night and Some Times on Saturday. While Walking-Around That Stadium for maybe 1,000 or More Times, My Knees got some really “Hard-Work” Toward Some Serious Arthritis. After 44-Years, I was having a really “Hard-Time” Even-Walking, much less Walking Around a Stadium on a Thursday or Friday Night and all of my All-American Bowl Game Coaches wanted me to have a Couple Knee Replacements. I always knew that The Knee Replacements Might be able To-Help me walk, but I was always afraid that it might “Go-Wrong” and I would not be able to “Even-Walk” and so I kept “Putting-It-Off” Until Later. Then, after 45-Years, I decided to “Go-Ahead” and have a Knee-Replacement on my Right Knee. I was supposed to have my Surgery on February 12, but one of my Doctors forgot to mail his Approval Info to Doctor Jared Braud, my Knee Replacement Doctor and it caused me to have To Have my Surgery on February 14 which was St Valentines Day. Dr. Jared L. Braud (In Photo) is an Orthopedic Surgeon at The Baton Rouge Orthopedic Clinic. He completed a Fellowship in Adult Reconstructive Surgery at the Cleveland Clinic and specializes in both primary and revision Hip and Knee Joint Replacement Surgery. Dr. Braud Completed his Undergraduate Education at LSU Baton Rouge with a Bachelor of Science in Biological Engineering. He went on to receive his Doctor of Medicine and completed his Orthopedic Surgery Residency at LSU School of Medicine in New Orleans. During this time he was recognized as the LSU Orthopedic Program Intern of the Year in 2010-2011, LSU Orthopedic Program Resident of the year in 2013-2014 and 2014-2015. Dr. Braud also received recognition for his Orthopedic in Training Exam scores and for his research during this residency. He was also active in Resident and Medical Student Education. He served as an Instructor of an Orthopedic Critical Concepts Course for The LSU 4th Year Medical Students as well as a guest lecturer for The LSU Emergency Medicine Intern Orientation and Skills Day. After Completion of his Orthopedic Surgery Residency he was accepted into a Fellowship Position at The Cleveland Clinic. Here he Specialized in Adult Reconstruction with a Focus on Revision Surgery. During this Fellowship Year, his Research Project was Accepted as a Podium Presentation at The American Academy of Hip and Knee Surgeons Annual Meeting. At the completion of The fellowship, he accepted a position with Baton Rouge Orthopedic Clinic. Dr. Braud is currently accepting new patients at The BROC Office located on The Baton Rouge General Campus on Bluebonnet Blvd. Dr. Braud is trained on The Stryker Mako Robotic Assisted Knee Replacement Surgical System. Dr. Braud is also one of The First Physicians in Baton Rouge to use this technology to perform The Robotic Knee Replacement Surgery at The Baton Rouge General Hospital. The Stryker Mako Robotic Assisted Knee Replacement Surgical System gives Surgeons More Accuracy when placing Implants and Customizes Surgical Plans based on a patient’s bone anatomy and diagnosis. Knee Replacements are one of the most common procedures in The United States and are expected to increase by nearly 700 percent by 2030, said in a news release. Dr. Braud did a Fabulous Job in Replacing my Right Knee and He Found-Out that my Old Knee was one of The Worst Arthritic Knees that he had ever Seen, but after about 45 Days, I Am Walking with a Brand-New Stryker Mako Robotic Right Knee, But I Am Not Looking Forward To Replacing My Left Knee, Next Year. ODell Beckham, Jr Was An “Under The Recruiting Radar Super-Star” Until My 2010 Super Elite Top-Gun Combine/Camp! He Then Signed With LSU Before Becoming All-American and All-Pro! Every single Football season, there are some great High School Football Players who for some reason are over-looked by the various Recruiting Services and College Coaches. In fact, some of these players are simply unbelievably talented players looking for an opportunity to show their talent to the various College Coaches. In 2010, there were some really fabulous High School Football players in Louisiana that were in this category. One was named Odell Beckham Jr who was the son of former LSU great Odell Beckham Sr. And another one was Ronald Martin. Young Beckham was from the same Isidore Newman High School in New Orleans that had already sent at least two players to the NFL by the names of Peyton Manning and Eli Manning. Beckham also joined Cooper Manning as the only two Newman High School football players to ever reach 1,000-yards in Receiving. Beckham also averaged 30-yards per punt return for Newman High School. Also! His dad, Beckham Sr was also a great Running-Back for LSU and his mom, Heather, was an All-American Track Sprinter for LSU in 1991-93, winning two NCAA Indoor Sprint Championships and three NCAA Outdoor Sprint Championships. This should have been enough to alert a few college coaches that there might be a Super Football Player at Newman HS and enough Interest to get some Scholarship Offers, but as the summer started, and at My 2010 Super Elite Top-Gun Combine/Camp, and before his Senior season, Beckham did not have a Single Scholarship Offer. But lets “Fast-Forward Back” to The Week of July of 2013, because this was the week that Beckham Jr was announced as one of the 44 players on the 2013 Paul Hornung Award. This Prestigious Fourth Annual Paul Hornung Award goes to The Most Versatile Player in Major College Football. In The Recent LSU Spring Game, Beckham (6-0, 187, 4.44, JR-2L) caught a beautiful 79-yard touchdown pass from QB Zach Mettenberger (6-5, 230, 4.8, SR-2L) in the End-Zone with only 4:11 left in First Half. He then caught another 21-yard touchdown pass from QB Stephen Rivers (6-8, 225, 4.9, SO-SQ) with 5:40 left in the game. 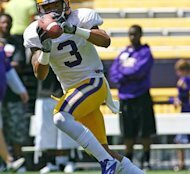 Beckham finished The 2013 LSU Spring Game with six catches for 202-yards and two Touchdowns as he helped lead the White Team to a 37-0 Victory. I was at that 2013 LSU Spring Game and I Selected Beckham as the LSU Spring Game MVP. In 2012, As a True Sophomore, Beckham had 43 catches for 713-yards which was outstanding for a team that does not throw that much. The huge thing that makes Beckham so Special is that he has returned 35 punts for 320-yards and scored on two of them, including an incredible 89-yard return for a touchdown in the fourth quarter against Ole Miss. He also has averaged 12.9 Yards Per Touch on 138 touches in two years. Beckham also has an amazing 1,784 All-Purpose Yards in two years. Everyone in the Football Stadium knows exactly when Beckham is going to get the football and many times it is in a crucial situation and he is still able to make positive yards. Ronald Martin was another Super-Star Player in Louisiana in 2010 who was. also Flying Under the Recruiting Radar. Martin and Beckham Continued to make One-Handed Catches at The 2010 Super Elite Top-Gun Combine/Camp. Martin did not have one single scholarship either, but he also Signed with LSU after The Combine. This should give Hope to every High School Football Player in the Country who does not have any scholarship offers in mid-summer before their Senior Season. Dallas Cowboys #1 Super Scout Gil Brandt Gets NFL Hall of Fame Honors. I Would Like To Congratulate My Former Boss, Gil Brandt of The Dallas Cowboys on Being Selected To The NFL Hall of Fame. My Former Boss, Gil Brandt, was The Original #1 Super Scout and he has just been Honored with an NFL Hall of Fame Award and We Want to Give Him All of The Congratulations That He Totally Deserves. Gil Brandt was The Dallas Cowboys Vice President of Player Personnel from 1960-1988. Along with Head Football Coach Tom Landry and General Manager Tex Schramm, Brandt Helped The Dallas Cowboys To-Get to Five Super Bowls and Then Winning Super Bowl Championships in 1971 and 1977. It has been a long time since I called The Dallas Cowboys my home, but I have kept up with The Cowboys and The NFL ever since I left in 1977. 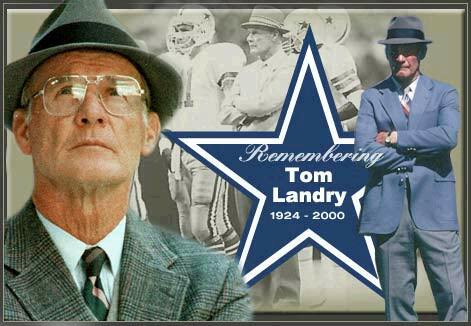 When I was working for Head Coach Tom Landry and Super Scout Gil Brandt, I felt that I was able to help The Dallas Cowboys to be a Little More Successful. I also Researched Really Hard To-Find a Photo of My Old Boss as I Knew him! Gil Brandt Will Always be My Hero and Being Famous as Being The Father of The Innovative NFL Scouting Methods with The Dallas Cowboys. His Unbelievable Innovation Helped him To Identify More Information on a Potential Player in The NFL Draft, in The Format of More Skills in The Form of More Information and More Measureables. Brandt is also Credited With The Unbelievable Philosophy of Drafting The “Very best Athlete Available” Rather than Drafting a Player of The Team’s Positional Need. Brandt Set Standards For The Dallas Cowboy Scouts To Evaluate Players for The NFL Draft and Various Other NFL Teams Found-Out About Them and Started Using Them. Another One of The Most Innovative New Scouting Techniques Developed by Brandt was The Evaluations of Super Athletes in Other Sports than Football. Three of The Most Famous Super Athletes were Dallas Cowboys Hall of Fame Super-Star Bobby Hayes In Track; One of my Dallas Cowboys Scouting Best Friends, Cornell Green, In Basketball; and Toni Fritsch In Soccer. Brandt took in Consideration These Two Great Athletes (Hayes and Green) with Great Measurables in Other Sports for The Potential Dallas Cowboys NFL Draft Choices. I will Never Forget Looking at The Bob Hayes Files and seeing that He Not only ran a 9.1 in The 100-Yard Dash, but he also had a 44-Inch Vertical Jump and something like a 3.91 Pro-Shuttle. Of Course, Hayes had never Caught a Touchdown Pass, but he Learned Really Quickly. The Dallas Cowboys were The First NFL Team To-Sign a College All-American Basketball Player and then turn him into a Super NFL Player. Green was From Utah State, and he Was a Two-Time All-American Basketball Player in 1961 and 1962. 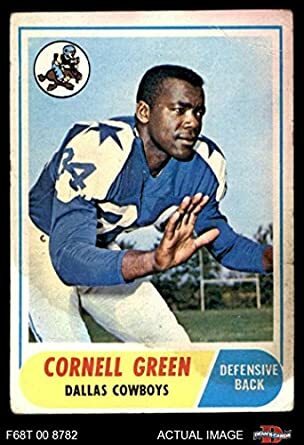 Cornell Green was The First Brandt-Success with a Basketball Super-Star and in 13 Years with The Dallas Cowboys, Green was Selected To The NFL All-Pro Team 8 Times. My Good Friend, Cornell Green, Retired from Football with The Dallas Cowboys and then Cornell became a Dallas Cowboys Talent Scout With me in The Same 1975 Year and of course, Green Never Played Football until The First Day of Practice in his Rookie Year, but Cornell Averaged an Incredible 28 Points and 13 Rebounds as a Senior and Recorded a Fabulous 43-Inch Vertical Jump. I will Never Forget Laughing with Cornell when we talked about his First Day of Football Practice in The Summer Pre-Season Practice in 1962. Although he had Never Played A Down of Football before His First Summer Football Practice, Cornell Made The NFL All-Rookie Team in That Same Rookie-Year in 1962. Cornell and I Were Joined by Two Other Dallas Cowboys Talent Scouts in Reid Johnson and “Big John” Wooten. Brandt and The Dallas Cowboys were also The First NFL Team To Use Mental and Personality Tests to Help To-Determine The Mental Capacity of High Potential NFL Draft Choices. Brandt was also Responsible For Helping To Create The Annual NFL Super Scouting Combine. In 1974, after spending Two Years as a Graduate Assistant for Head Football Coach Hayden Fry, at The University of North Texas, I got a call from Dallas Cowboys Super Scout Gil Brandt. Out of All of People in The Country, Gil Brandt told me that he had An Opening for a Talent Scout with The Dallas Cowboys. I Drove to Dallas and Interviewed for The Job and I was all set to take The Job when The Cowboys decided not to hire another Talent Scout. In the meantime, I had Interviewed with Lanier Business Products to get back into Sales. Then, one day, I got a call from Lanier and Later that month, I took a job as a Salesman with The Lanier Business Products in Dallas, Texas. As a Word-Processing and Dictating Machine Salesman, I became one of The Top Salesmen in The Dallas Sales Office and I was Already Being Groomed to become a Sales Manager or a National Sales Trainer. I also won Three Lanier Salesmen of the Month Awards. Then, About a year later, I was in Garland, Texas, on a Sales Call, and I got another call from Gil Brandt. “Max, we are now ready to hire another Talent Scout and I was Wondering if you were still interested?” This was like a “Dream-Come-True For Me” so I became a Dallas Cowboys Talent Scout. One of the reasons that Gil Brandt Hired Me was, because he was Impressed with My Innovativeness and Hard Work. In Fact, after In Helping my Graduate Assistant Coach, Billy Brashier, who was The Secondary Coach, and also The North Texas Recruiting Coordinator, Coach Fry Got a Special Ruling from The NCAA to Make Me The Recruiting Coordinator, as a Graduate Assistant in my Second Year. Gil Brandt Hired me to become his In-House Assistant Talent Scout. As his In-House Assistant Talent Scout, I Developed some Pretty Exciting Innovative Programs that The Dallas Cowboys were still using for a many years after I left. One day, Gil Asked me To-Follow him Down The Hall, because he had a Huge Project for me! As I followed Gil down The Hall, we walked into one of The Coaching Staff Board Meeting Rooms where The Late NFL Hall of Fame Head Football Coach Tom Landry and The Late Dallas Cowboys Defensive Coordinator Coach Ernie Stautner were waiting for us. “Max, we want you to develop a Flip Chart For Our Coaching Staff,” said Coach Tom Landry. This Flip Chart that I Coordinated was The Rating and Ranking of Every Current NFL Player. I then Color-Coded Every Player in The NFL as to his Rating and Ranking. GREEN = Rookie or Two-year NFL player. I Developed This Huge Flip-Chart For Each NFL Team. Then, a Color-Coded Business-Card with The Name and Measuraeables of Each Football Player was placed in The Flip-Chart Sleeve For Each Position on The Football Field for Both The Offense and Defense For Each NFL Football Team. Another Dallas Cowboys Scouting Project that I Coordinated was The Development of a Texas Top 100 High School Football Recruiting List for College Football Coaches. We did this as a favor to College Coaches and we gave this list to Every College Team in The Country That Recruited Texas Players. That Included Almost Every Single College Team in The Country. All of these Innovative Factors Combined to help Super Scout Gil Brandt, Head Football Coach Tom Landry, and Team President Tex Schramm To Build The Dallas Cowboys into The Most Dominant Franchise in The 1960’s and 1970’s. During this time period, Brandt Was In-Charge of The Dallas Cowboys NFL Draft of Several Franchise Players,including Emmitt Smith, Bob Lilly, Lee Roy Jordan, Randy White, Mel Renfro, Roger Staubach, Ed “Too Tall” Jones, Rayfield Wright, Harvey Martin, Tony Dorsett, and of Course Bobby Hayes and Cornell Green. Another Unbelievable and Incredible Fact is that There Are 13 Dallas Cowboy Players in The NFL Pro Football Hall of Fame and Gil Brandt was The Super Scout That Helped Make All of Them a Dallas Cowboy. Then There Are 19 Players in The Dallas Cowboys Incredible Ring of Honor, and Gil Brandt was Involved in Making 15 of Them a Dallas Cowboy. For All of These Contributions to The Dallas Cowboys Organization, The Dallas Cowboys Owner and General Manager Jerry Jones made Gil Brandt The 22nd Member of The Ring of Honor in November. Now, The Hall of Fame Has Honored Gil Brandt at the highest Level possible. With Gil Brandt as The Newest Hall of Fame Inductee, The 17 Dallas Cowboys Selected To The NFL Pro Football Hall of Fame Include: Gil Brandt, Roger Staubach, Tom Landry, Tex Schramm, Bob Lilly, Tony Dorsett, Randy White, Mel Renfro, Troy Aikman, Rayfield Wright, Michael Irvin, Bob Hayes, Emmitt Smith, Deion Sanders, Larry Allen, Charles Haley, and Jerry Jones. Brandt and the rest of his Hall of Fame Class will be Officially Enshrined at The Pro Football Hall of Fame in Canton, Ohio, this Summer. I loved being a Dallas Cowboys Scout, but Lanier Business Products was calling me almost every day to come back to work for them. Then one day, Lanier Offered Me a Job that I Could Not Pass-Up. They Offered Me The Job of Lanier Sales Manager in Midland, Texas. This job would effectively Triple My Income! I really did not want to leave The Dallas Cowboys, but there was just too much money involved. I decided to go talk to The Late Dallas Cowboys President and General Manager Tex Schramm (In Photo with Gil Brandt) and see if they could either match The Lanier Salary and Commission Figures or at least give me a raise. “Max, you have done a great job for us and we love you. Soon, you will receive a raise, but it sounds like you have a pretty fantastic offer that you can’t pass-up,” said Tex Schramm. I was The Lanier Sales Manager in Midland, Texas for two years and then I was hired away by Micom Word Processing International to take over as their Micom Houston Branch Manager. After about a year, I left Micom To Found The First National High School Football Recruiting Service, in Houston, Texas. This National Free Agent Tryout Camp gives Former College and Former Professional Players, who might be “Flying Under The Radar” an Excellent Opportunity to show what they can do and Try To-Help them to get Themselves into or back into The NFL, Canadian Football League, Alliance Football League, World Football League, Europe Football League, Arena Football League, or Any Other of The New Professional Developmental Football Leagues which might be Starting To-Play in 2019. There was Also an CFL Saskatchewan Roughriders Scout In Attendance and Four Other Coaches and Player Personnel Representing The AFL Albany Empire Team. These Two Great-Looking Players who Checked-In Early and were with their Player Agent Calvin Williams were Wide Receiver Jazeric Peterson of Faulkner University and Cornerback and Kick Returner Dallin Finley of Southwest Minnesota State University. We had Around 50 Free Agent Players who Originally Signed-Up To-Attend The Lestini National Free Agent Tryout Camp and Super Combine, but due to the Terrible Weather Forecasts, including Freezing Weather, only 20 Players were able to Participate in the Event that was Highlighted by Four Players Who Broke a 4.0 in The Pro-Shuttle and Two Other Players Who Ran in The 4.1’s of The Pro-Shuttle. 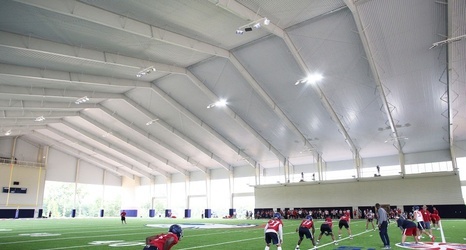 Our Lestini Super Free Agents Had The Great Privilege to Be Able To Perform In This Incredible And Beautiful New University Of South Alabama Indoor Facility. After Doing Some Intensive Research on These Lestini Professional Free Agents, I Found-Out That Several of These Lestini Free Agents Played in Some Various All-American Games After Their Senior Seasons. Five Lestini Free Agents Played in The Prestigious CanAm All-American Bowl Game Between The Canadian All-Stars and The American All-Stars. 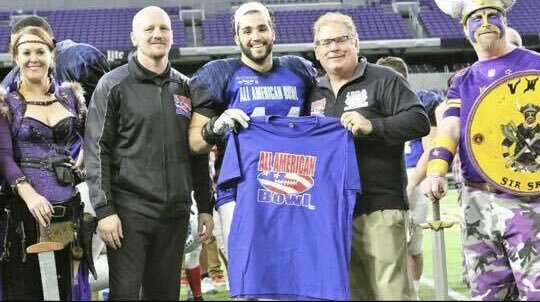 Tyler Affa (#44) Was Defensive MVP in The Annual CanAm All-American Bowl at U.S. Bank Stadium. Defensive MVP Tyler Affa of Seton Hill University Led The Five Lestini Free Agents as The Only Defensive Player while The Four Other Lestini Free Agents Included Wide Receiver Darius Clark of Newberry; SLOT Receiver Evan Cain of Western New England University; SLOT Receiver Marcus Campbell of LaGrange College; and Tight End Benjamin Galbraith of Delta State University. Bradley “Stick” Jefferson, was Also a Member of The Team USA All-American Eagles Team, which Faced The Mexico All-Stars in Olympic Stadium. The Aztec Bowl, along with The All-American Bowl and CanAm All-American Bowl, Are Annual All-Star Games That Features Players from NCAA Division I, II and III Schools Across The Country. Players arrived on in Mexico City on Tuesday and began practice Wednesday. Players also had the opportunity to visit Aztec Ruins. In The Aztec Bowl Game, Jefferson Earned MVP Honors For Team USA after Returning a Kickoff 99-Yards for a Touchdown. I am going to Rate Affa as a Tight End, because he made several Great Catches in The One-On-One Drills and he Impressed all of Our Lestini Combine Coaches. The Tight End/Defensive End MEARS RATING Standard is Set at 4.8 in The Pro-Shuttle and so Affa Received The Maximum 400 MEARS RATING POINTS in The Pro-Shuttle. When we got through with The Super Combine Part of The Lestini Combine Camp, we realized that we had Three Great Wide Receivers, Three Great Slot Receivers, and Two Tight Ends, and all Eight were Outstanding in The One-On-One Player Drills Competition. Two of The Three Wide Receivers ran a 4.2 or Better Pro-Shuttle, including #1 WR Jazeric Peterson (6-0, 195) (#13) of Faulkner University with a 4.13 Pro-Shuttle; and #14 Jareth Embry (6-0, 175) of Belhaven University with a 4.15 Pro-Shuttle. A Special Thanks To Talent Scout Special Agent Tony Mangini who Helped Get The Following Free Agents To The Lestini Free Agent Combine, including: WR #4 – Darius Clark; FS #5 – Christopher Blanchard; WR #6 – Jeffery Barnett; WR #10 –Marcus Campbell; SLOT #11 Evan Cain; RB #12 – Robert Catchings; TE # 31 Benjamin Galbraith; and DT #59 – Jacob Banegas. 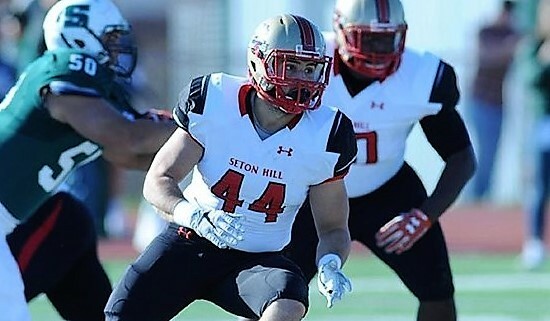 1 DE/TE – Tyler Affa – Affa of Seton Hill University Was One of The Most Impressive Players at The 2019 Lestini Professional Super Free Agent Combine and his Story is One of The Most Impressive Stories That I have Ever Heard-Of in my 45 Years as a Super Scout. This Super-Star Athlete had an Incredible 4.56 Forty and an Impressive 4.31 Pro-Shuttle. These Speed Measurables Are Really Impressive for his Position and The Really Incredible Fact About Affa (#44) is that he did not Play High School Football, but He Walked-On at Lackawanna Junior College, Lettered Three Years at Seton Hill University, and Then He Finished his College Career by Playing In The Annual All-American Bowl and Earning The Jim Marshall Defensive Player of The Game Award. The Affa Story is Totally Mind-Boggling. He Did Not Play High School Football, because he had a 1.67 GPA. After his High School Graduation, he Continued To-Work in “Dead-End” Jobs with Absolutely No-Goals. 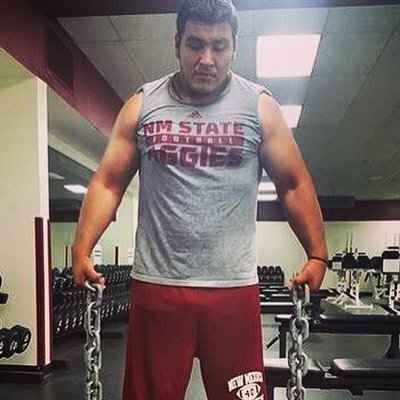 Then, one day, It All Clicked and Affa Decided to Start Lifting Weights and Play College Football in College. And The Rest Is History! Affa Walked-On at Lackawanna National Junior College in The Spring of 2014 and then Red-Shirted in The Fall of 2014. Affa, Then Played in 2015 and was an Outstanding Defensive Player and Earned a Scholarship To Seton Hill University where he Started for Three Years in 2016, 2017, and 2018. After his Outstanding Senior Season, Affa was Invited To-Play in The All American Bowl Game in Minneapolis, Minnesota and by Recording 6 Tackles and 2 Quarterback Sacks, Affa Won The Jim Marshall Award for The Outstanding Defensive Lineman in The Game. Affa is 6-1 and 235 and he Ran a 4.56 in The Forty and a 4.31 in The Pro-Shuttle. He could Play DE, TE, FB, or Linebacker. I am going to Rate him as a Tight End, because he made several Great Catches in The One-On-One Drills and he Impressed all of Our Lestini Combine Coaches. 2 WR/TE Darius Clark – Clark (6-1, 220) Was an Outstanding Wide Receiver/Tight End of Newberry College Recorded an Outstanding 4.29 Pro-Shuttle. At First, I Thought That I would Rate Clark as a Tight End, but after Looking at his Highlight Film, and Seeing Him Make Two Absolutely Fabulous Deep Catches in The One-On-One Player Drills Competition, I Decided To Rate and Rank Clark as a Potential Wide Receiver, but Clark Can Definitely Play Both Positions. Although I Rated him as a Wide Receiver, as you can see in his Photo, Clark is a Real Physical Freak and he Could Also Become an Outstanding Tight End at The Next Level. Darius Clark, From Wadmalaw Island St John’s High School in South Carolina. In his Newberry College Career, Clark Finished with 1,045 All-Purpose Yards, including 384-Yards Rushing, 264-Yards Pass Receiving, 397-Yards on Kickoff Returns, and 83-Yards Passing. He also Recorded 10 Tackles. Walking into The Weight Room at Newberry College, Head Coach Todd Knight knew that a Huge Challenge was Getting Ready To Come. His Football Team loves Neck Wrestling, a Grappling contest between Two Players that helps T0-Build The Neck Muscles, but while The Players Battle each other, Darius Clark calls out Knight. His Head Coach is The Best, and Clark wants The Crown. s a Super and Versatile Athlete, Clark was Selected to Play in The All-American CanAm Bowl Game. This All-American Bowl Game is Played Between The Canadian All-Star Free Agents and American All-Star Free Agents with Scouts From Both The NFL, CFL, and Various Other Pro Football Leagues in Attendance. 3 WR/FS – Jazeric Peterson – Peterson is an Absolute Wide Receiver Freak. On his Highlight Film, Peterson Made Some Incredible and Unbelievable Catches. I watched about 10 of his Plays and he made Several Incredible Catches, Including Two or Three Defenders on him and he made Several Deep Catches, including a Couple 75-Yard Touchdown Passes; One 85-Yard Touchdown Catch; and One 92-Yard Touchdown Catch. Peterson (#13) also made an Unbelievable Game-Winning Touchdown Catch in a 55-52 Victory over Reinhardt as his Faulkner Football Team Started The Season with a 4-0 Record which was The Greatest Start in Their History. In The Lestini Super Free Agent Combine, Peterson was One of The Most Impressive Players in The Combine and also The One-On-One Player Drills Competition. In The Lestini Combine, Peterson Recorded The Best Standing Broad Jump of The Combine with a Very Impressive 122-Inch Standing Broad Jump and he also Recorded an Outstanding 4.13 Pro-Shuttle. Due to The 35 Degree Temperature, his Forty was not anywhere close to his Career-Best of 4.42 or his Hudl Best of 4.44. Peterson Recorded Two 4.62 Forties at The Lestini Combine, although I Actually Timed him with a 4.59 Clocking. I then Averaged his Best Two Forty Times and my 4.59 and Gave Him a 4.48. In The Lestini One-On-One Player Drills, Peterson Might Have Been One of The Most Impressive Players as I had him with Five Outstanding Catches, including an Unbelievably Impressive 10-Yard Out Pattern with The Cornerback Covering him Extremely Close. 4 WR/RET – Jareth Embry – Embry came-back for his Second Lestini Super Combine Camp, after Putting-Up Some “Mind-Boggling” Measurables at The 2018 Lestini Super Free Agent Combine with a 4.37 Forty, a 4.06 Pro-Shuttle, and an Outstanding 128 Standing Broad Jump. In The 2019 Lestini Free Agent Super Combine, Embry also Recorded Another Outstanding 4.15 Pro-Shuttle, but The Freezing Weather Probably Hindered His Best Measurable Efforts, but Embry is Still An Outstanding Player having some Incredible Speed and Agility Measurables. I have been in Scouting for over Four Decades and I have Occasionally Seen Players Record Some Measurables that Embry did at The 2018 Lestini Free Agent Combine. Embry as he ran the Fastest Forty with a 4.37 Forty and Tied with The Fastest Pro-Shuttle with a Fabulous 4.06 Pro-Shuttle. In The 2018 Lestini Free Agent Camp Pass-Catching Drills, Embry made at least Three Unbelievable One-Handed Catches, with Absolutely “No-Drops” in The Passing Drills and then he made One of the Most Incredible and Most Incredible Catches of the Day in The Pass-Defense Drills against an Outstanding Cover Cornerback. In The 2019 Lestini Free Agent Camp Pass-Catching Drills, Embry (#7) made Several Great Catches, Including One Incredible Post-Pattern, with a Great Cover Cornerback Covering-Him; another Incredible Go-Pattern; and a Tremendous 10-Yard-Out and Go for an Incredible Touchdown. Embry was an Outstanding Wide Receiver in The “Air-Raid” Passing Offense at Belhaven University and he is Unbelievable on his Highlight Film. Embry also Recorded an Outstanding 38-Inch and a 40-Inch Vertical Jump to go with his 23-Feet and 6-Inch Long Jump Record. 5 CB/RET/SLOT Bradley “Stick” Jefferson was The Highlight of The Lestini Pro-Shuttle with Two Incredible Pro-Shuttle Timings. His 3.87 Timing was The Fastest of The Lestini Super Free Agent Combine and his other 4.13 was also Outstanding. His Best Pro-Shuttle at The Hudl Super Combine was a 4.2 Timing, but he also did an Outstanding 38-Inch Vertical Jump, a 4.41 in The Forty, and 10 Reps on The Bench Press. In his Lestini 40-Yard Dash, Jefferson Ran Two 4.47 Timings, Plus I Timed him in a 4.45, so I Averaged a 4.47, My 4.45, and his Hudl 4.41 and Gave Him a 4.43 Clocking. Bradley Jefferson was a Member of The Team USA All-American Team, which Played The Mexico All-Stars. Jefferson Played his High School Football at Washington-Wilkes High School in Washington, Georgia. In 2017, at Averett University in Danville, Virginia, Jefferson Blocked Two Kicks and in 2018, Jefferson and Two Other Senior Teammates Were Selected To Play in The Aztec All-American Bowl XLV in Mexico City. As a Cornerback and Return Specialist, Jefferson, was a Member of The Team USA All-American Eagles Team, which Faced The Mexico All-Stars in Olympic Stadium. The Aztec Bowl, along with The All-American Bowl and CanAm All-American Bowl, is an Annual All-Star Game That Features Players from NCAA Division I, II and III Schools Across The Country. Players arrived on in Mexico City on Tuesday and began practice Wednesday. Players also had the opportunity to visit Aztec Ruins. In The Aztec Bowl Game, Jefferson Earned MVP Honors for Team USA after returning a Kickoff 99-Yards for a Touchdown. I Originally Rated and Ranked Jefferson as a Cornerback with a 2,515 MEARS RATING, but I then Rated him as a SLOT Back and Return Specialist with a 2,615 MEARS RATING and Averaged Both Ratings and Gave him a 2,565 MEARS RATING. 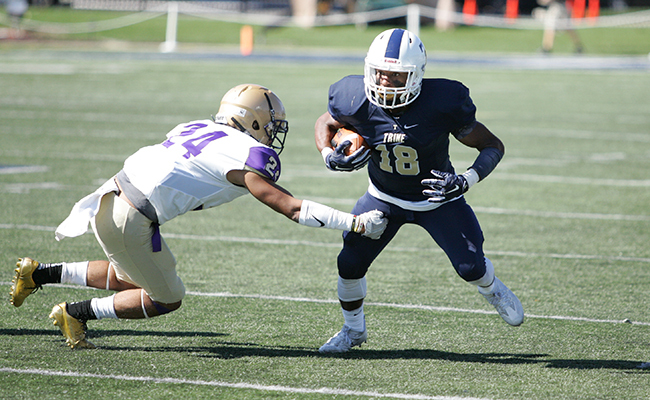 Jefferson finished his Averett Career as USA South All-Conference Selection and helped Averett To-Post an 8-2 Record and a 6-1 Record in League Conference Play. 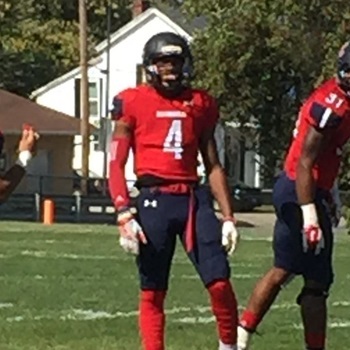 Jefferson made The All-Conference Team at Two Positions, as a Cornerback and Return Man, as he Set The USA South Record for The Longest Kickoff Return for Touchdown in The 2018 Season with a 100-Yard Kickoff Return in The Season Opener, Against Hampden-Sydney. 6 TE – Benjamin Galbraith – Galbraith From Olive Branch Lewisville High School, Mississippi and Delta State University, is an Outstanding Blocking Tight End, but he also has Great Hands as Demonstrated in The Lestini One-On-One Player Drills With Several Great Catches. 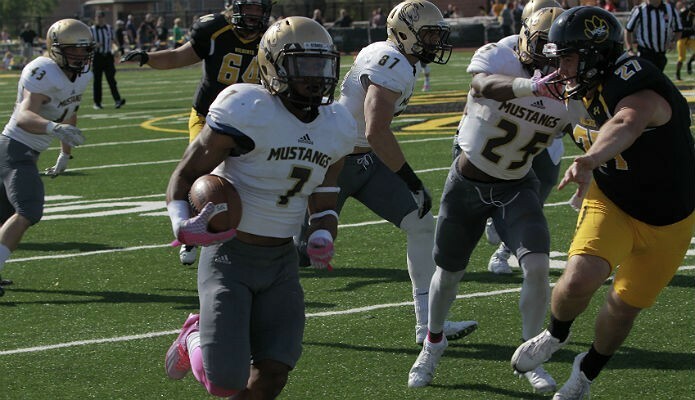 Although Galbraith Played in an “Air-Raid Passing Offense” Using Four Wide Receivers, at Delta State and he only Caught 11 Passes for 82-Yards and One Touchdown as a Senior, at The Lestini Super Combine One-On-One Player Competition, Galbraith Caught 8 Passes, including Two Outstanding Catches with Close Coverage by a Defensive Back. In The Lestini Combine, Galbraith Did an Incredible 4.29 Pro-Shuttle and an Outstanding 105 Standing Broad Jump, but with The Cold Weather, he only Ran a 5.09 Forty, so During a Break in The Combine, I asked him what his Best Forty and Vertical was and he Told me a 4.7 Forty and a 34-Inch Vertical Jump. He also said that he had done a 116-Inch Standing Broad Jump, and so, due to The Cold Weather, I gave him all Three Measureables. Five Lestini Free Agents, Including Galbraith, Played in The Prestigious CanAm All-American Bowl Game Between The Canadian All-Stars and The American All-Stars. 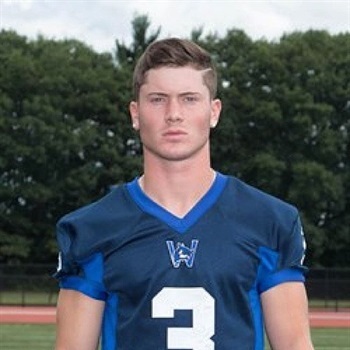 7 SLOT Wide Receiver – Evan Cain – Cain From Hudson High School in Massachusetts, West Field State University,and Western New England University is an Unbelievable, Versatile Receiver and Athlete who can play a Lot of Different Positions and he is Also a Great Leader, as he was Voted as a Senior Tri-Captain on his 2016 Western New England Team. On his Highlight Film, Cain was an Unbelievably Versatile Wide Receiver Freak. On his First Play on His Highlight Film, Cain Ran a Beautiful 10-Yard Stop-And-Go Pattern for a 60-Yard Touchdown. On his Second Play, he Ran a 10-Yard Out-And-Go for a 75-Yard Touchdown; and then on The Third Play, he Ran a Deep-Post Pattern for a 90-Yard Touchdown. 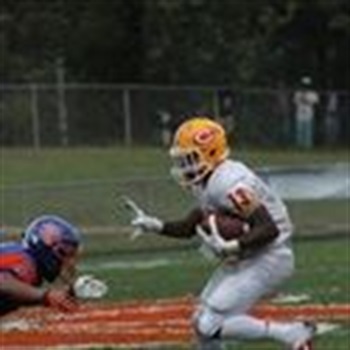 On Another Highlight Film, Cain Recorded Three 75-Yard Punt Returns For a Touchdown; a 95-Yard Kickoff Return For a Touchdown; and an 85-Yard Touchdown Catch. Cain Also Made Three Outstanding Catches in The One-On-One Player Drills Competition. In The Lestini Super Combine, Cain Ran an Incredible 3.97 Pro-Shuttle, but due toThe Cold Weather, he did not run his best Forty. His Best Forty at The Lestini Combine was a 4.59 Forty, but his Best Forty at The NFL Combine was a 4.44 and That is What I Gave Him. In The CanAm All-American Bowl Game With Teammates Tyler Affa, Marcus Campbell, Darius Clark, and Benjamin Galbraith, Cain was The Prestigious “All-Out” Award Winner. 8 CB – Dallin Finley – Finley is a Great Two-Way Player who made several Great Plays on Offense and also on Defense. In the Passing Drills Player Competition, Finley (#7 In Photo) made at least Two Exceptional Catches and then in the Passing Defense, he again made at least Two Exceptional Pass Breakups and one Interception. Finley Played his High School Football at Kennesaw Mountain, Georgia where he was The Team MVP as a Senior in 2012 when he Recorded 61 Tackles, 3 Interceptions, and a Super Quarterback. 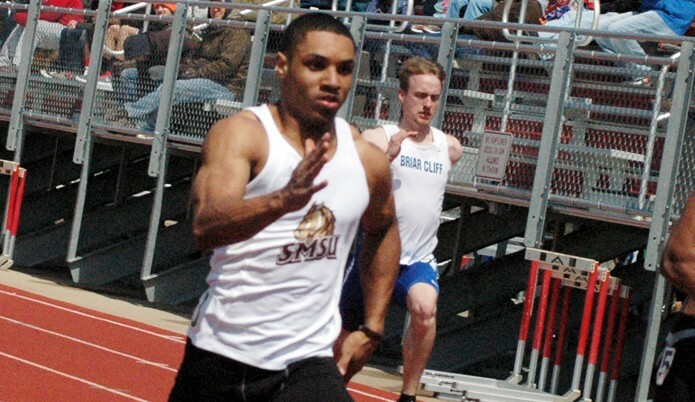 Finley was also a Track Super-Star where he Ran a 10.8 in the 100-Meters and he also has Exceptional Strength (See Biceps in Photo) with an Unbelievable 375-Pound Bench Press. In 2015, when Finley was a Sophomore, he Won The 100-Meters at The Red Raider Open with his 10.8 Clocking. His 4×100 Sprint Relay Team Clocked a 43.7 and Finished with a Second Place Finish. On his Highlight Film, Finley is Outstanding and he looks a lot Faster on his Film than his Two Official 4.56 Forties that he Ran at The 2019 Lestini Free Agent Camp. I actually Timed him in a 4.53 Forty. At The Hudl Super Combine, Finley Recorded a 4.45 in the Forty; a 38-inch Vertical Jump; and a 4.22-Pro Shuttle. I averaged his 4.45 with my 4.53 and came-up with an Official 4.49 for his Forty Time. 9 SS/CB – Kunle Ayinde – Ayinde From Blaine, Minnesota Might have been One of The Most Impressive Players at The Lestini Professional Free Agents Combine, but His Outstanding Feats Might Have Been “Under-The-Radar” except for his Unbelievable and Incredible 3.94 Pro-Shuttle. First of All, his Best Pro-Shuttle at The Minnesota Pro-Day was a 4.4 Pro-Shuttle, but he has been Working and Training-Hard To-Improve His Best by Over 4 Seconds. At The Minnesota Pro-Day Combine, Ayinde Recorded Some Outstanding Measurables with a 36 Vertical Jump, a 4.52 Forty, a 120-Inch Standing Broad Jump, and 10 Reps of 225 Pounds on The Bench Press. At The Lestini Professional Free Agent Combine, he Recorded Two 4.6 Forties, but I Timed Him with a 4.58 Forty and so I Averaged his 4.52, 4.6, and my 4.58 and gave him an Official 4.55 Forty. He did a 119-Inch Standing Broad Jump, but I Gave him his 120-Inch Standing Broad Jump at his Pro-Day. And then, Of Course, his Incredible 3.94 in The Pro-Shuttle Gave him The Maximum 400 MEARS RATING Points. Hard-Work and Complete Dedication has Helped Ayinde in His Career, Ever Since The Ninth Grade when he Came-Out For Football for The First Time. After Four-Years of Hard Work and Dedication, it Really Paid-Off when The Minnesota Gophers Offered him a Preferred-Walk-On Opportunity and his Hard Work and Dedication, Again, Got him a Full Scholarship. In 2016, as a Fourth-Year Junior, Avinde Helped Lead The Gophers To Win a Trip to The Holiday Bowl and then in That Holiday Bowl, Avinde Recorded an Unbelievable “Pick-Six” Touchdown To-Clinch a 17-12 Victory over Washington State. The “Pick-Six” was Ruled Not To Be a “Pick-Six”, but it led to The Winning Touchdown For The Minnesota Gophers. Then as a Fifth-Year Senior, Ayinde (#4) was The Defensive Veteran for The Gophers and With Great Versatility With The Ability To-Play All Three Positions in The Gophers Secondary. Then, Late in The Season, The Gophers Secondary was Stretched-Thin With Injuries and Ayinde was Moved From Strong Safety to Cornerback and He Recorded a Career-High 9 Tackles, Including 8 Solo tackles, 1 Tackle for a Loss, and 1 Pass Breakup in a Huge 24-17 Victory over The University of Illinois. Ayinde Finished his 2017 Senior Year with 51 Tackles, including 37 Solo Tackles, 2.5 Tackles for a Loss, 5 Pass Breakups, and 1 Interception. In The Lestini One-On-One Player Drills Competition, Ayinde Made Several Outstanding Defensive Plays, including One Great Deep Pattern that he Batted-Down The Ball and Another Batted-Down Pass on a Crossing Pattern. I thought that he had Excellent Speed and Capable To-Play All Three Positions in The Secondary at The Next Level. “I Wake-Up Everyday and Thank The Lord For All His Blessings and I Make The Most of all of my Opportunities and “Big-Breaks” that Happen in My Life,” Kunle Ayinde. We all Thought That The Oklahoma Sooners Quarterback Kyler Murray (#1) (5-10, 195, 4.32) was Probably Not Going To Play in The NFL, because he had Already Signed a Multi-Million Dollar Contract To-Play Major League Baseball with The Baseball Oakland Athletics, who Drafted him #9 in The 2018 Major League Draft. “The Baseball Career for Kyler Murray had always had a “Very Defined Path” which included playing Football for The Oklahoma Sooners, but for only in The 2018 Football Season,” Said his Agent Scott Boras. The Problem with This “Very Defined Path” for Kyler Murray was that he Might become One of The Greatest Quarterbacks To Ever Play Quarterback in College and The Same Might Also be said about him in The NFL. Murray is one of The Best Athletic Dual-Threat College Quarterbacks that I Have Ever Seen. He just has The Unbelievable Athleticism, and there is a reason that he was one of The Most Sought-After Recruits in The Country, but he is more than just a Great Athletic Dual-Threat Quarterback, because Murray has an Incredibly Quick-Release and He Throws Really Impressive Darts past Defensive Backs. So, my Question is this and Since Murray Is An Athletic Freak! What Would Happen if Murray Won The Heisman Trophy Award and then Decided to Play in The NFL in 2019? After weeks of Speculation, we now know that Heisman Trophy Winner Kyler Murray has now decided to Declare for The 2019 NFL Draft. Although Murray has Declared for The NFL Draft, it is not The Official End Of His Baseball Career with The Oakland Athletics who Drafted Him #9 in The 2018 Major League Baseball Draft and had Already Signed him to a Multi-Million Dollar Contract To-Play Major League Baseball. When Murray Signed With The Oakland Athletics about a week after The Major League Baseball Draft, he Signed with The Strict Understanding that he was Definitely going to play One More Football Season for The Oklahoma Sooners as The Replacement for The Heisman Trophy Oklahoma Quarterback Baker Mayfield. He also Stated that he would be at The 2019 Baseball Spring Training for The Athletics. 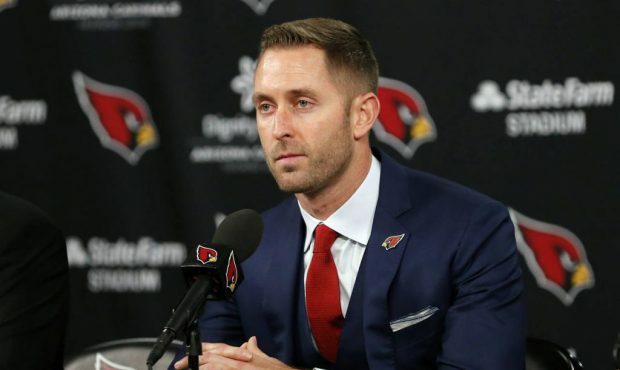 What is Really Interesting is that The Arizona Cardinals Hold The NFL #1 Draft Choice and their New Head Football Coach, Kliff Kingsbury, has already been Quoted as Saying that he would Draft Kyler Murray as The #1 Overall Selection in The 2019 Draft, if given the Chance. An ESPN Scout Adam Schefter has Reported that The Arizona Cardinals are Prepared to do just that, Although They Had Already Drafted Super Quarterback Josh Rosen in The#10 Overall Selection in The 2018 NFL Draft. Coach Kingsbury has Made a Fabulous Reputation in Coaching Great Quarterbacks to Stardom as he has Already Coached Such Super-Stars Johnny Manziel at Texas A&M and Patrick Mahomes at Texas Tech. It is also Pretty Obvious that Coach Kingsbury would love to be able to Coach Heisman Trophy Award Winning Quarterback Kyler Murray in his First Football Season with The Arizona Cardinals. After Hearing About The Kyler Murray Decision, There was an Interesting Response from The Major League Baseball Response, as they Decided To Waive a Rule, at The Athletics Request To Prohibit Teams From Offering Draftees a Major League Contract. The Athletics were already prepared To Place Their Prize Draftee, Kyler Murray (In Photo), on Their 40-Man Spring Roster, and Essentially Fast-Tracking Him into The Baseball Major Leagues, in an Huge Effort to Convince Him to Stay With His Baseball Contract. The Athletics also Sent Some of Their Top High-Ranked Officers, Including Vice President of Baseball Operations Billy Beane and General Manager David Forst in an Attempt to try to Convince him To Continue his Baseball Career. Even after The Oakland Athletics Top Brass and The Top Major League Executives Efforts to get Murray to Change his Mind about going to The NFL instead of going to The Major League Baseball, Murray has Continued To Keep His Decision to Declare for The NFL. The Difference In-Money is not that much, because Rookie Deals in The NFL Could Actually Duplicate his Baseball Signing Bonus and his Salary Could be Gigantic for a Heisman Trophy Winner. Also, as a #1 NFL Draft Choice, Murray Could Actually Be Guaranteed a Bigger Salary and Make More Money in Football. In The 2018 Heisman Trophy Season, Kyler Murray ( #1) Broke Two Of The Oklahoma School Records of The 2017 Heisman Trophy Winning Quarterback Baker Mayfield, as he Recorded a School Record of Total Offensive Yards With 5,362-Yards and Total Touchdowns Accounted For with 54 Touchdowns. Murray broke those School Records with One Fewer Games than Mayfield. The Football Bowl Series had Never had a Quarterback in History who had Averaged 300-Yards Passing and 60-Yards Rushing, but in 2018, Heisman Trophy Winning Oklahoma Quarterback Kyler Murray Averaged an Incredible 311.5-Yards Passing and 71.5-Yards Rushing for The Entire Football Season. CHAPTER FIFTEEN – Most Unbelievable Facts To Remember About The Brownwood Texas State Championship! About The 1960 Brownwood High School Texas State Championship! One of the Most Unbelievable Facts to Remember about The Brownwood High School 1960 Texas State Championship Team was that some of these Players, who had NEVER Played on the Varsity had Incredible Seasons. Everyone Expected the Six Returning Letterman to Play Extremely Well, including Seniors Strong End/DE Lawrence Elkins, OT/DT Ronney Moore, OT/DT Mike Greer, Fullback/Linebacker A.D. Carnes, QB Jimmy Herman, and Junior Tailback/Safety Max Emfinger, but some of the Other Starters were just Plain Mind-Boggling, because No Other Players had any Experience on the Varsity. In Finishing The 1960 State Championship Season, I Rushed for 1,363-Yards and had 2,623-Yards of All-Purpose Yardage, Scored 10 Rushing Touchdowns, Threw Two Touchdown Passes to Elkins (San Angelo and Mineral Wells), Had Two 90-Yard Kickoff Returns for Touchdowns (Killeen and Weatherford), Had One 65-Yard Interception for a Touchdown (San Angelo), Had 4 Two-Point Conversions, Accounted-For 98-Points and Threw Two Touchdown Passes, and Recorded 6 Interceptions on Defense, including Four Interceptions in One Game Against San Angelo and One Interception (Waco University and Graham). In The 1961 Co-District Championship Season, I Rushed for 674-Yards and had 1,056-Yards of All-Purpose Yardage, Scored 9 Rushing Touchdowns, had Three Two-Point Conversions, 60-Points Scored and One Interception (Weatherford). Ben Elledge was a Super-Star Quarterback who was Fabulous as he led the Brownwood “B” Team to a Great 8-1 Season, Losing only to San Angelo Central, but then Beating Breckenridge Twice. With the New Offense, using the 1-4 Cutback and 2-8 Cutback as Their Most Dominant Plays, it was of Vital Importance that the Two Offensive Guards and Center Needed to be Extremely Quick and Athletic and Senior Gerald Pitts at 149-Pounds and Junior Bobby Staudt at 162-Pounds were Incredible, to go with a 149-Pound Center David Smith in Pulling And Leading Through The Hole. Speedy Junior Wingbacks John Cadenhead at 152-Pounds and Junior Charles Coffey at 140-Pounds and Senior Strong End Lawrence Elkins at 178-Pounds would Double-Team the Defensive End. Junior Quarterback Ben Elledge, at 178-Pounds would join Fullback A.D. Carnes at 171-Pounds, and All Seven of These Super-Stars would Lead-Me around the Right End 1-4 Cutback or Left End 2-8 Cutback and then I would “Cutback” behind all of them for Huge Gains. With Senior Ronney Moore at Strong Tackle, he would also be Blocking in the Cutback and Senior Mike Greer, who was the Weak-Side Tackle would go Downfield and Join Junior Quick End Eddie Daniel in making Key-Blocks in the Middle of the Field, after I had Broke-Away from all other Would-Be Tacklers. On Defense, Juniors Ronnie Davis at 161-Pounds, Charles Coffey at 140-Pounds, and Terry Dummer at 165-Pounds were Extremely Great Defensive Players and Sometime Offensive Stars. Sophomores James Crow at 154-Pounds, Doug Young at 168-Pounds, Dale Wheelis at 184-Pounds and Grayson Wetzel at 150-Pounds were Outstanding Defensive Players, but Remember that all of the Starters played on Both Sides of the Line of Scrimmage. Senior Quarterback Jimmy Herman at 149-Pounds and Senior Quick End Donnie Gersbach at 156-Pounds also made Great Offensive Plays as did Juniors Jimmy Thompson at 144-Pounds and Ronnie Middleton at 150-Pounds. The 4-AAA 1960 All-District Team Included Several Brownwood Lions, including Quarterback Ben Elledge, Running Back Max Emfinger, Strong End Lawrence Elkins, and Quick Guard Gerald Pitts on Offense and on Defense with Tackle Ronney Moore, Linebacker A.D. Carnes, and Linebacker Eddie Daniel. In that 1960 State Championship Game, I Rushed for 107-Yards on 16 Carries, had Two Pass Catches for 29-Yards, and a 46-Yard Kick-Off Return and Finished with 182 All-Purpose Yards and a 9.6-Yards Per Touch Average. As a Football Player, in the Games that I Played-In, My High School Football Record was 28-2-1 in The Three Years on the Varsity Including a 1960 Football State Championship and then In Track, I was a Member of Two Regional Championships in 1960 and 1961 and a State Championship in 1962. I was the Only Three-Year Letterman in my 1962 Graduating Class in Both Football and Track. After The 1961 Football Season, I was Selected All-District, All-Area, All-State, and All-American by Wigwam Wisemen of America. I was Very Excited about making The All-American Team as I joined Five other Brownwood High School Lion Legends, including some of my Heroes: QB Leondous Fry and OT Ben Woodson in 1952; RB Ray Masters in 1953; QB Tommy Butler in 1958; and End Lawrence Elkins in 1960. All of these Players have been Selected to The Gordon Wood Hall of Champions.